Skin camouflage is an excellent, non harmful way to conceal scars, birthmarks, pigmentation disorders, age spots etc. It is the art of applying special creams and powders so that the blemish/scar etc matches the surrounding skin. Skin or cosmetic camouflage is a therapy that has been developed to help people who have disfigurations that cannot be remediated through cosmetic surgery or dermatology – or cosmetic surgery is not a preferred option for the person. Often people with skin imperfections also have deep psychological scarring caused by poor image and feelings of embarrassment and even shame. Paramedical Skin camouflaging can help a person build confidence and reduce psychological damage caused by their skin imperfections. Can Skin Camouflage Help Me? How Effective is Skin Camouflage? Skin camouflage provides a simple solution for most people with scars, skin diseases, pigment disorders etc. Cosmetic skin camouflage can be effective for both minor and major skin conditions and discolorations. 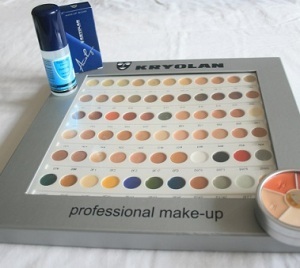 Regular everyday cosmetics are not able to deal with severe pigmentation or scarring. Regular cosmetics also reduce during the day/night. However the specialist skin camouflage cosmetics are far more effective in reducing the appearance of skin discolouration, marks, pigmentation issues, scars, tattoos etc. and last for up to eighteen hours! Whilst the skin structure itself is not altered this is an instant improvement of the visual appearance of the condition. The products and creams are applied in layers and then covered with a fine coat of specialised sealing powder providing an effective, long-lasting and even waterproof cover. The creams, professional makeup and powders can only be removed with a special gentle cream cleanser. To see how effective skin camouflage can be, have a look at some examples. Where Can I get help with Skin Camouflage? Clinique Matrice, based in Toowong provide paramedical skin camouflage make up tutorials showing how to camouflage skin conditions. Elaine Marley is a qualified member of the British Association of Skin Camouflage and is experienced and knowledgeable in paramedical skin camouflage techniques and products. She can help you through an initial consultation to assess your condition and the best way to camouflage your scars, blemishes, skin disorder etc. During the consultation Elaine will undertake careful skin tone comparison and recommend the right products, brands and shades for your specific skin-type and skin condition. Elaine will then teach you how to apply the different layers yourself with the correct product to closely match the surrounding skin colour, effectively reducing the visibility of your skin imperfection.